So basically, this is Guangzhou's chocolate ville, banners here are written in at least 4 languages: Chinese, English, French and Arabic. 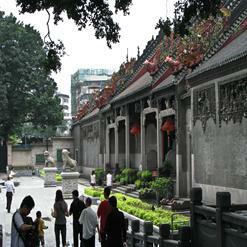 This is probably one of Guangzhou's most diverse neighborhood! You'll find delicious middle eastern restaurants before you meander into the side streets full of Africans.